As you may or may not know, I'm a horse lover. I rode horses for more than a decade and they will always have a special place in my heart. So when I started to see the horseshoe inching it's way into accessories and clothing, I got very excited. Horseshoes mean good luck and I think we'll have some good luck with these pieces. I would describe this skirt in one word: charming. It's a beautiful silk cotton blend that is perfect for work or play. This bangle is so ready for an arm party. Layer it up and it will fit right into your usual rotation of bracelets. Combining the horseshoe element with another very popular trend, the tassel. I love it! Simple. Why so spendy for such a small piece? Because its fantastic quality. It won't turn your neck green. This little necklace is timeless. If you indulge in the horseshoe trend, which you should, you must promise me one thing. ALWAYS wear your horseshoe turned up as you've seen in the pieces above. 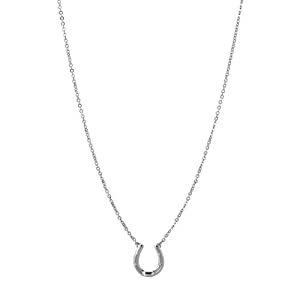 An upside down horseshoe lets all of the luck fall out. Remember that.